Have you ever considered renting an ‘affordable’ exotic car for a day but haven’t pulled the trigger because you’re one frivolous purchase away from a messy divorce? Well, don’t consider it a lost opportunity just yet, because if this heavily abused rental Ferrari 458 Italia is anything to go by, then consider it a bullet dodged. It should come as no surprise to anyone that cars made by boutique Italian manufacturers in small numbers with high-strung powerplants weren’t made to be driven every day. They’re made to be washed with cloth diapers in a hermetically-sealed garage and ogled through a security camera. However, if said car is part of a cheap exotic rental car fleet and gets used regularly in one of the most punishing climates in the world, a fair few things will eventually, and perhaps catastrophically go wrong, which is what we see in this video. Rob Ferretti, who operates his own exotic rental car company, Gotham Dream Cars, did market research on a rival company in Las Vegas, Gotham’s newest rental location. 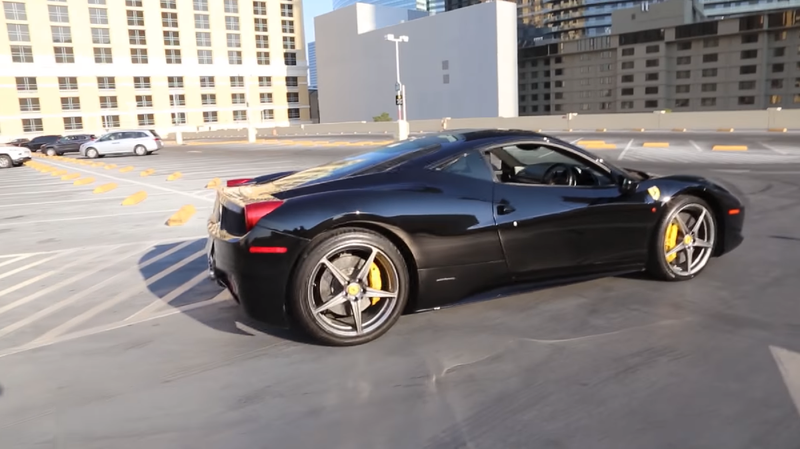 Ferretti hired a black Ferrari 458 Italia for a day, a privilege that cost him north of $600, well below the rate that Gotham would charge, and for good reason. The car, from 20 feet away looked presentable and together, despite some usual dings and dents, but a close-up look revealed that the bumper was severely misaligned, badging was missing from the side of the car, the driver’s seat was literally ripped open, the wheels were scratched and scuffed, interior buttons didn’t work, the engine made a nasty ticking sound, and the differential sounded straight up broken. One car. One driver. One track. Welcome to Jalopnik&apos;s RING TESTED on /DRIVE. Warning lights lit up the dash on startup and the car’s 73,000 mile odometer figure wasn’t doing it any figures, meaning that the last Ferrari with a naturally aspirated V8 - a car that should by any measure appreciate in the coming years - is now rendered nearly worthless. Ferretti also went into detail about the talk he got from the fleet owner before renting the car, which might’ve been scarier than the state of the car itself. The shady exchange was sprinkled with half-truths and outright lies about how Ferrari won’t sell you a single wheel (they will), how renters always steal the Ferrari’s emblems (they don’t) and that you can’t insure a car twice (you can). Perhaps the business is made to appeal to idiots in Las Vegas on vacation that don’t care what the car actually drives like and want to pretend like they’re somebody for a Friday night before they realize that the mini-bar vodka just put their account into overdraft. However I think that for die-hard car enthusiasts, it’s just not worth it. Rent for a day, regret for a lifetime.